Last edited by bbqnewbie on Sat Nov 19, 2011 11:51 am, edited 1 time in total. Either of the charcoal grills will be great for what you might need and each has their pluses & Minus's but in general will do the job. If you go camping a lot, many here love the Go-anywhere more than the other 2 you've shown. With the Go anywhere, you have the versatility of using it as a hibachi type grill or a small roaster and even a smoker if you set it up right. It's long enough to place 2 good sized fish in for grilling or smoking. The Cast iron Hibachi do a great grilling job but being cast iron, will take a fair time to get hot but once they are hot, they are ripping good for getting sear marks on your steak....but they are really only good for grilling whereas the other 2 can do small roasts. The Cast iron Hibachi are quite heavy too compared to the other two, but Nothing can grill as good as cast iron over a fire...for this they win hands down. So if you just want a good grilling tool, the cast Iron Hibachi is the best choice, if you want some versatility for roasts or smoking as well as grilling, I'd choose the Go- anywhere. The only reason I haven't suggested the smokey jo is I'm not sure if the lid would be high enough to be useful for a roaster but if they work as good as a regular sized kettle, they'd be great too. I've seen some Weber go-anywheres on ebay and quite frankly, by the time you take in the freight costs, they go for not much less than a brand new one. They retail for $119 and are usually found in most stores that stock Weber BBQs so if theres one near you...get a new one.One joker is selling them on ebay at full retail plus $15 freight making them about $135 instead of $119...avoid like the plague. Davo! You say 2 good sized fish. I agree with Davo's post but again our fish may flop over the sides. The Weber go anywhere will be easier resold if you decide charcoal is not for you. mmm talking about fish...might go down near the Swansea channel this morning and catch good friday dinner...yeah sounds great...i've got a few lures I wanna try out. They'll be cooked on the Performer.....if I get em.....and nope..won't be going down to the fish shop ...have some salmon cutlets at the ready if no bite are had. I've got a smokey joe and use both briquettes and charcoal in it. Tend to grill/roast tbones, chops and chicken in it. But is not suitable for big roasts, chickens are ok but you have to regulate the airflow if using charcoal to avoid to much charring. Do find that I can close the air vents off and save what fuel I have left for the next use, bonus when using gidgee charcoal as I can get almost two cooks out of one lot. My other griller is open and longer but has no lid thus any fuel you use burns right out, but is set up for cooking for more than two people. Last edited by bbqnewbie on Sat Nov 19, 2011 11:55 am, edited 1 time in total. What's the quickest & easiest method for lighting the heat bead briquettes? Are self lighting ones any good or should I use standards with jiffy lighters? 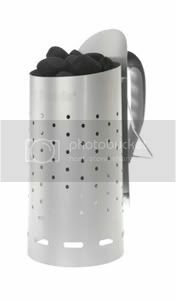 I can't speak from personal experience (I'm not sure I've seen self lighting lump charcoal) but most folk round these parts seem to go for a "charcoal chimney". I'm sure someone who owns one can give you the low down. Yeah Charcoal chimney is the go.....heatbeads have a good one at about $40 they last for ages......I don't recommend the self lighting briquettes in the yellow bag.....much prefer the red bag or the grey bags 7kg or 10 kg respectiviely. If using a chimney, just fill it first up about 1/3rd if you're using the go-everywhere.....should only take 2 firelighters about 20 minutes before they are ashed over and ready. If you can't hold your hand over the heat more than 2 seconds...it's a good grilling temp. I purchased the Weber Go Anywhere and had my mind set on using Heatbead brickettes, but the salesman convinced me to try lump charcoal and Heatbead natural lighters. They didn't have any charcoal chimneys in stock & couldn't tell me exactly when they were coming in. This annoyed me but nevertheless I took all my gear home and got it all ready for action. Anyway I got some charcoal & and piled it in the middle of the bottom grate & lit up the lighters underneath, but this worked without success and I was unable to get them all red hot and they eventually went out very quick. I had all the vents open & used at least 6 lighters. What am I doing wrong? Should I just give up until I can get a chimney? Looks like the salesman put you straight into the deep end. I would recommend you start with heatbeads. They are easier to move around to control temperature. As KD said use the lump sparingly on top. Keep in mind that lump burns very hot. You could get yourself a Hot Devil weed burner ? If trees screamed when we cut them down, We wouldn't. If they screamed all the time we would.